I know I'm my own worst enemy here, but hiding the truth is wrong. So I'm going to give it to you straight: If you're thinking that dating or marrying somebody who wears a Rolex, Patek or Grand Seiko means you're marrying a sensible, level headed, wise, emotionally balanced man — probably you are. But if that man has two fabulous watches, take a breath, look both ways before crossing the street, and be prepared to bolt at the first sign of danger. 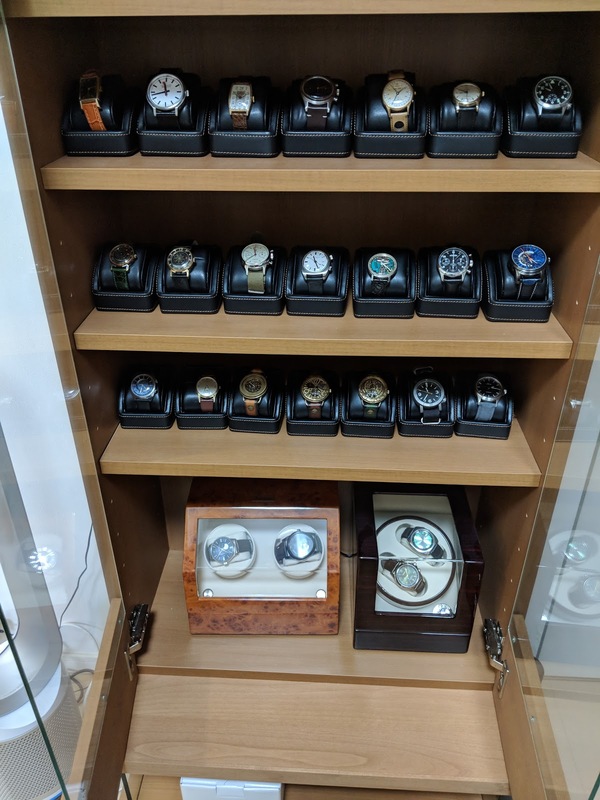 If the man who makes your heart sing has three or more watches, then he could very well be a collector, and along with being a watch collector comes a wide assortment of personality disorders and other dangers you should be aware of. You can never have too many watches. Photo from Wikimedia. 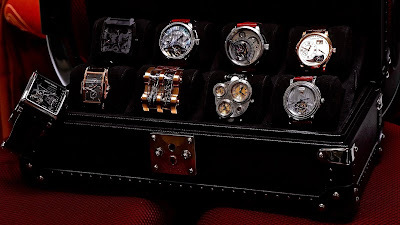 Watch collectors are unlikely to be prompt, despite being surrounded by timepieces, because we take time to set our watches. It can take many slow minutes to set a watch precisely, especially if it's a grand complication. Waiting for a watch collector getting ready to go out is like waiting for a three-year-old who's just learned to tie his shoelaces. But your watch collecting partner will tap impatiently on his watch's crystal whenever you're taking too long getting ready to go out. Watch collectors are unlikely to be neat because all those watch boxes have to go somewhere. We're going to be looking at our watches all the time. Not because we're bored with you, are anxious about the time, or would rather be somewhere else, but because we love looking at our watches. Even if you accept that, it's still going to drive you nuts. Watch collectors are not likely to be rich, though we may have been before we started collecting watches. It's preordained what we want to see during vacations. At each and every famous world heritage site, monument, funky looking restaurant, beach, and in random places, we're going to take a picture of our wrist with that site in the background. It's going to feel like being driven by somebody who keeps one foot on the brake. And we're going to take a picture of our first born child with the watch in the foreground too. You may know that the shaking of our arm at random times is voluntary, purposeful, and essential for winding our watch, but most other people are going to assume it’s due to a degenerative disease, and they'll ask you about it. It's not hard to know when somebody is collector. In addition to visiting every watch shop in every city we see, we stop to take pictures of clocks. You're going to hate traveling with a watch collector. We’re a mess of contradictions. We have a diver’s watch, but we don’t dive. We own a pilot’s watch, but we don’t fly. We flash our exotic driver’s watch, but sit behind the wheel of a Toyota Camry. We bought a watch that cost five figures, but we’re not...nevermind. When we watch movies we freeze scenes which show the actors' watches. We won't resume the movie until we've figured out what watch they're wearing, even if that means taking an image of that scene, posting it on a online watch forum, and waiting for the answer. 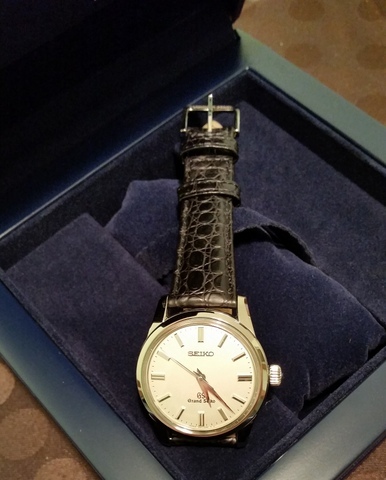 How long can it take a watch collector to match watch band, watch, and wardrobe? Let's put it this way: You'd better get used to enjoying your morning coffee alone. eBay, all night long. Need I say more? We sneer at people wearing smartwatches, and if that happens to be your Aunt Clarice or nephew Sandy, so be it. We become intolerably irritable when FedEx or UPS misses the delivery date. If it's raining, you have only one umbrella between the two of you, and your collector is wearing a watch that's not waterproof to at least 100 meters, plan on getting very wet. You're going to think your partner is having an affair, but what's really happening is he or she's trying to intercept a package with a watch before you see it. “Five dollars for a cup of coffee!” Just bite your tongue. Watch collectors show a fear for magnets that may appear totally irrational to you. You need to get used to your watch collecting partner suddenly dashing into a dark place like a closet or bathroom without warning. If you don't know why, ask. We curse when we overshoot setting the date on our watches and have to spin through another 30 days. It happens more than you think. And the words we utter are both bad and loud. You might not have enough money for a vacation, but if you do it will be to Glashütte, Germany or Iwate, Japan. Thanks. Yes, falling in love with a watch collector comes with risks.